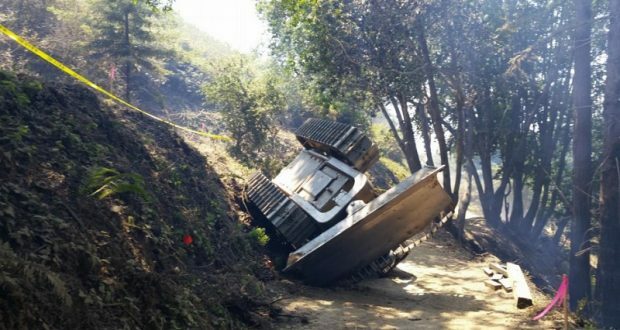 MONTEREY COUNTY — CAL FIRE has released a preliminary report about the bulldozer accident that claimed the life of a Friant man during the Soberanes Fire. Yosemite High graduate Robert Reagan, 35, died nearly instantly after the dozer he was operating rolled over, pinning him under the roll-over protection system [ROPS] of the dozer. ROPS are the protection bars mounted for the rollover protection system to the engine compartment. On Tuesday, July 26, at approximately 11 p.m., Reagan was operating a dozer, attempting to access an area for fireline construction, but had to maneuver around a fire engine that was blocking the roadway. According to CAL FIRE investigators, as the bulldozer proceeded slowly over a steep embankment in an effort to reach the lower road, it rolled onto its left side and roof, ejecting Reagan from the cab. Fire personnel who witnessed the event immediately responded, along with a paramedic who was in the immediate area, but determined that Reagan was deceased. Preliminary evidence at the scene indicates that Reagan may not have been wearing his seatbelt, and that it is likely that the left door was open. The Soberanes Fire was reported on July 22, at 8:48 a.m. in Monterey County, approximately one mile east of Soberanes Creek in Garrapta State Park. Within 36 hours, the fire had burned more than 23,500 acres and was just 10 percent contained. Almost 3,000 personnel were assigned to the fire, including Reagan, who arrived at the incident on Tuesday, July 26, at approximately 7 p.m. Just four hours later, he was killed.